Canada's military plans to dismiss three cadets from its premier officer training academy in Quebec after a video was made of a student at the school masturbating over a copy of the Qur'an. 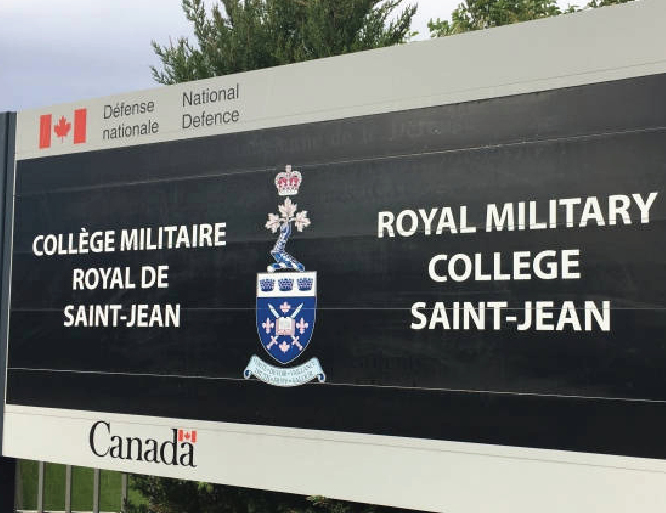 Five other cadets at the Royal Military College Saint-Jean have been disciplined in an incident that comes as National Defence faces an uphill battle to recruit more minorities and may even be forced to open its ranks to foreign nationals. The video was recorded over the Easter long weekend, defence officials revealed. "We're absolutely appalled it took place," Lt.-Gen. Charles Lamarre, chief of military personnel, told CBC News. "What they did and what they were involved with has absolutely no place in the Canadian Armed Forces." The internal investigation has been hampered because the video in question was apparently deleted after it came to the attention of the school's administration. Lamarre said the circumstances of who deleted the video — and when — are unclear. "It was destroyed. It was deleted," he said. As far as military investigators can determine, it was not uploaded or posted anywhere on social media. One of the cadets performed the sexual act over the Muslim holy book while another filmed the scene. The event took place on March 31, off campus at a chalet in the province's Montérégie region. The cadets apparently brought the Qur'an with them to the chalet. "I don't think any Canadian who has right Canadian values would be interested in seeing that," said Lamarre. He defended the school's administrators, saying they moved quickly, launching an investigation as soon as the existence of the video was brought to their attention by students who had seen it. "This is a deplorable situation," the prime minister said Friday, responding in French to questions in an Ottawa suburb as he voted in an advance poll in the Ontario election. "We are taking this very seriously. It does not represent our Forces, our beautiful diversity and our Canadian values. We will follow up quite aggressively on this." Eight cadets attended the party, but only four took part in the episode, said another senior defence official who spoke Friday on background prior to Lamarre's comments. Of the three ordered expelled on the grounds of unsatisfactory conduct, two are appealing the decision. It will take until mid-June to decide their fate. One of the cadets will not appeal the expulsion. Five others have been given warnings and black marks on their records. They were granted leniency based upon their degree of involvement and contrition, said the official who was only authorized to provide procedural information and not comment. Lamarre said his office is looking into the matter and that the desecration of any religious symbol by a member of the Canadian Forces will not be tolerated. "Due process will be applied, and those found to be responsible for this vile act, will be held accountable for their actions," said Lamarre in a formal statement issued Friday. "We are a diverse and inclusive force. We reflect the Canadian mosaic; diversity is our strength. We demand the best of those who serve, as Canadians rightly demand the best of us." "Imagine if they had not done this horrible act now, we would not have discovered them," he said. "They would have been in the army for a long time. They would have graduated and perhaps even become senior officers with a racist attitude like that, lacking respect, lacking sensitivity to the faith of their colleagues. It's serious." The imam said the Armed Forces are sending the right message with the punishment issued to those involved. The incident in Montérégie is a blow to the military's stated goal of being more inclusive, diverse and attractive to all Canadians, regardless of their backgrounds. Lamarre, who has been at the forefront of the diversity drive, said the military deserves credit for dealing swiftly and sternly with the outrage. "We're hoping all Canadians, including those from the visible minority community and groups that have not been as well represented in the past, will look upon this and recognize that we take this seriously," he said.